Downy Brome (Cheatgrass) (Bromus tectorum) is a monocot weed in the Poaceae family. In Oregon this weed first evolved resistance to Group A/1 herbicides in 2005 and infests Grass seed. Group A/1 herbicides are known as ACCase inhibitors (Inhibition of acetyl CoA carboxylase (ACCase)). Research has shown that these particular biotypes are resistant to clethodim, fluazifop-P-butyl, quizalofop-P-ethyl, and sethoxydim and they may be cross-resistant to other Group A/1 herbicides. Greenhouse trials comparing a known susceptible Downy Brome (Cheatgrass) biotype with this Downy Brome (Cheatgrass) biotype have been used to confirm resistance. For further information on the tests conducted please contact the local weed scientists that provided this information. There is no record of differences in fitness or competitiveness of these resistant biotypes when compared to that of normal susceptible biotypes. If you have any information pertaining to the fitness of Group A/1 resistant Downy Brome (Cheatgrass) from Oregon please update the database. The Herbicide Resistance Action Committee, The Weed Science Society of America, and weed scientists in Oregon have been instrumental in providing you this information. Particular thanks is given to Daniel Ball for providing detailed information. Kumar, V. and P. Jha. 2017. First report of Ser653Asn mutation endowing high-level resistance to imazamox in downy brome (Bromus tectorum L.). Pest Management Science DOI 10.1002/ps.4673 : . BACKGROUND: Bromus tectorum L. is one of the most troublesome grass weed species in cropland and non-cropland areas ofthe northwestern USA. In summer 2016, a B. tectroum accession (R) that survived imazamox at the ﬁeld-use rate (44 g ha–1)inan imidazolinone-tolerant ( IMI-tolerant or Clearﬁeld™) winter wheat ﬁeld was collected from a wheat ﬁeld in Carter County, MT,USA. The aim of this study was to determine the resistance proﬁle of the B. tectroum R accession to imazamox and other ALSinhibitors, and investigate the mechanism of resistance to imazamox. RESULTS: The R B. tectorum accession had a high-level resistance (110.1-fold) to imazamox (IMI) and low to moderate-levelscross-resistance to pyroxsulam (TP) (4.6-fold) and propoxycarbazone (SCT) (13.9-fold). The R accession was susceptible tosulfosulfuron (SU) and quizalofop and clethodim (ACCase inhibitors), paraquat (PS I inhibitor), glyphosate (EPSPS inhibitor)and glufosinate (GS inhibitor). Sequence analysis of the ALS gene revealed a single, target-site Ser653Asn mutation in R plants.Pretreatment of malathion followed by imazamox at 44 or 88 g ha–1did not reverse the resistance phenotype. CONCLUSION: This is the ﬁrst report of evolution of cross-resistance to ALS-inhibiting herbicides in B. tectorum. A single-pointmutation, Ser653Asn, was identiﬁed, conferring the high-level resistance to imazamox. Ball, D. A. ; Peterson, C. J.. 2007. Herbicide tolerance in imidazolinone-resistant wheat for weed management in the Pacific Northwest U.S.A. : 243 - 250. Winter wheat ranks high in importance as an agricultural crop in the Pacific Northwest states of Washington, Idaho, and Oregon. Winter annual grass weeds such as jointed goatgrass (Aegilops cylindrica), downy brome (Bromus tectorum), feral rye (Secale cereale), wild oat (Avena fatua) and Italian ryegrass (Lolium multiflorum) have the same life-cycle as winter wheat and are difficult to control in conventional wheat production systems. These weeds annually account for millions of dollars of lost wheat production and reduced quality (i.e. discount by impurities). There has been only moderate success in controlling winter annual grasses in wheat by utilizing multiple-year crop rotations with spring crops and fallow periods, and with chemical control. Selective herbicides have been available for chemical control of downy brome, Italian ryegrass, and wild oat. 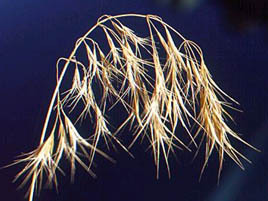 However, before use of imazamox herbicide with imidazolinone-resistant (CLEARFIELD*) wheat, there was no herbicide that could selectively control jointed goatgrass, feral rye, or volunteer cereals in winter wheat. The first commercial release of an imidazolinone-resistant winter wheat variety in the Pacific Northwest was made during the 2003 growing season. Plant breeders in the Pacific Northwest are continuing to develop imidazolinone-resistant winter wheat varieties adapted to a range of Pacific Northwest production regions. One issue of concern for wheat varietal development is that single-gene tolerance to imazamox in CLEARFIELD* varieties can sometimes show visible crop injury, and possibly, yield reductions in response to herbicide applications. Crop tolerance can vary with time of herbicide application relative to wheat stage of growth, environmental conditions that reduce the wheat plant's ability to metabolize imazamox and, possibly, with specific wheat varieties. A multiple year and location study was conducted to evaluate imazamox tolerance in CLEARFIELD* wheat lines being developed for Pacific Northwest production regions. Results indicate that during specific years and locations, single-gene CLEARFIELD* varieties differed slightly in their relative tolerance to imazamox. The most important determinant of crop tolerance was related to herbicide application rate and timing..
Menendez, J. ; Gonzalez-Gutierrez, J. ; Prado, R. de. 2007. Characterisation of a triazine-resistant biotype of Bromus tectorum found in Spain. Weed Research (Oxford) 47 : 113 - 121. A population of Bromus tectorum infesting an olive grove at Córdoba (Spain) survived simazine use rates of 3.0 kg a.i. ha-1 over two consecutive years. Non-tillage olive monoculture and two annual simazine applications had been carried out for 10 years. The resistant biotype showed a higher ED50 value (7.3 kg a.i. ha-1) than that of the susceptible control (0.1 kg a.i. ha-1), a 73-fold increase in herbicide tolerance. The use of fluorescence, Hill reaction, absorption, translocation and metabolism assays showed that simazine resistance in this biotype was caused by a modification of the herbicide target site, since chloroplasts from the resistant biotype of B. tectorum were more than 300 times less sensitive to simazine than those from the susceptible biotype. In addition, non-treated resistant plants of B. tectorum displayed a significant reduction in the QA to QB electron transfer rate when compared with the susceptible biotype, a characteristic that has been linked to several mutations in the protein D1 conferring resistance to PS II inhibiting herbicides. Resistant plants showed cross-resistance to other groups of triazine herbicides with the hierarchy of resistance level being methoxy-s-triazines ≥chloro-s-triazines > methylthio-s-triazines > cis-triazines. The results indicate a naturally occurring target-site point mutation is responsible for conferring resistance to triazine herbicides. This represents the first documented report of target site triazine resistance in this downy brome biotype..